As we enter our third year of publication, due to popular demand, we have introduced the option to buy your subscription to ScooterNova magazine via Direct Debit. Our current edition 12 signals the end of another year’s worth of subscription for many readers who have signed up from edition 1. A lot of you have asked about having a Direct Debit payment that will mean you don’t have to remember to renew your subscription annually. To be honest it not only simplifies things for you, but for us as well. So for all those either about to renew their subscription or who wish to subscribe for the first time, you can find the link to the new Direct Debit option here. Simply click on this and follow the instructions. Once completed you will receive a confirmation email a short while afterwards and then payment will be arranged with your bank. Of course if you prefer to use Paypal, or your debit or credit card, then you still can do. Just follow the link via the ‘subscriptions‘ page on our website at www.scooternova.com. Card holders can also telephone us on 01934 417834. And for those who prefer the old methods of cheques you can still put on of those in the post to us (payable to Scooter Products) and of course cash is king if you visit our stall at a scooter event. 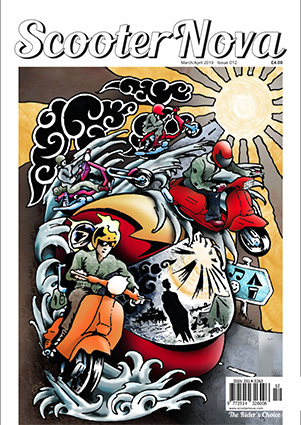 Don’t forget, if you have missed any previous editions of ScooterNova magazine then back issues are available, except for edition 1 which has sold out! Thank you all for your continued support, ride safe and see you on the road!